This statue honors the members of the U.S. Army's Golden Knights, a demonstration parachute team, and commemorates their 50th anniversary. The knight, a bronze figure painted gold and standing nearly seven feet tall, is represented in classic Medieval armor. The statue rests atop a 12-ton base of polished black granite inscribed in gold inlay with the names of the team's members. The inscription commemorates the Golden Knights, the names of the original 1959 team, and the names of team members from 1960 to 1969. It also bears the inscribed images of the U.S. Army Parachute Team shield and the insignia of the team's 50th anniversary. The remaining three sides of the base are inscribed with the names of team members since 1969. A team coin was placed under the granite base at the installation. Front: ESTABLISHED IN 1959, THE UNITED STATES ARMY PARACHUTE TEAM (USAPT), / "THE GOLDEN KNIGHTS", REPRESENTS THE BEST SOLDIERS THE U.S. ARMY AND / AMERICA HAVE TO OFFER. CELEBRATING THE TEAM'S 50TH ANNIVERSARY, / THIS MONUMENT WAS DEDICATED TO THE MEN AND WOMEN WHO HAVE / EARNED A PLACE IN HISTORY AND WILL BE HONORED HERE FOR ALL TIME. The statue was sponsored by the Golden Knights Alumni Association and included a substantial individual donation made by Golden Knights alumnus Jim "Skippy" Cassell and his wife, Rona Cassell. The base and statue arrived at Fort Bragg on August 22, 2009 and were greeted by a gathering of current members, team alumni, and family and friends. The dedication took place on December 19, 2009 with team members, alumni, and family and friends attending. In 1959, nineteen Airborne soldiers from several military units came together to create the Strategic Army Command Parachute Team (STRAC). The team was created to compete internationally and against Soviet skydivers, who dominated the fledgling sport. They performed so well that the Department of Defense officially recognized them on June 1, 1961 as the United States Army Parachute Team. They acquired the nickname "Golden Knights" in the early 1960s. The Golden Knights now consist of traveling teams that travel all over the United States performing aerial shows, creating a positive image for the U.S. Army and its recruiting mission. 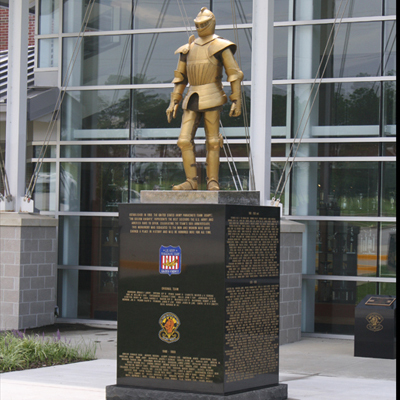 The statue was conceived as part of the events commemorating the 50th anniversary of the Golden Knights in 2009. The idea for the statue was developed by alumni during a reunion in 2007, and they envisioned its location in front of the Museum which had been created in 2003. The figure of the knight was based on a statuette awarded to early Golden Knights when they left the team. The concept also called for the inscription of the names of all former members. The effort to compile a complete roster became a significant research project and included searches of military rosters, log books, order books, team records, and phone calls with alumni. The statue is located in front of the Golden Knights Museum on Butner Road in Fort Bragg. The statue is located on a semi-circular area in the concrete plaza in front of the museum.